There were 38 press releases posted in the last 24 hours and 153,135 in the last 365 days. In this letter, we want to illustrate how the Tamils in Sri Lanka are scared to live with Sinhalese as one nation, and understandably so. NEW YORK, NEW YORK, USA, March 18, 2019 /EINPresswire.com/ -- US Tamils sent the following letter to the UNHRC member states to urge about "UNHRC Resolution Should Call for Referendum for Tamils in Sri Lanka, Instead of Devolution of Power." If there is a UNHRC resolution for Sri Lankan war crimes, then it should include a referendum to let the Tamils decide that what kind of political solution there needs to be for their peace, safety, and to permanently secure their homeland. Tamils have been attacked by Sinhalese many times since Sri Lanka's independence from English rule in 1948. The Sinhalese use the Sinhala epic poem the Mahavamsa in particular to justify attacks and massacres. The Sinhalese wrote this chronicle to scare the Tamils. It is a fabricated story. 1. One important lie is that King Vijay was born to human female and a male animal lion. This myth has been used to threaten the Tamils that the Sinhalese have animal mentality shaping the Sinhalese thinking like a lion. 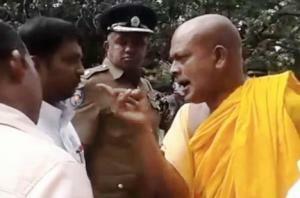 The Mahavamsa wants the Sinhalese to embody behavior like ruthlessness, heartless, inhumane, brutal, overarching force, and and to act with dreadful violence and prejudice towards the Tamils. 2. The second lie is that the God Buddha told to the author of the Mahavamsa to keep Buddhism for 5000 years in Sri Lanka. We wonder what God Buddha even knew about island nation of Sri Lanka 2600 years ago. Even if he knew, he would not have told the author to promote the genocide in the name of his philosophy. 3. The third lie is to encourage the murder of non-Buddhists, who are viewed as non-human and sinners and therefore can be killed like wild beasts. 4. The fourth lie is native Tamil people are invaders from India, who were the Tamil speaking Hindus there even before the arrival of the King Vijay . There is a history that Sri Lanka and India were connected by land many thousands of years ago. Even during the 2004 Tsunami, many buried cities around Palk Strait were exposed. These all show that the Tamils are an ancient and native people of Sri Lanka. These four and many more other points show the Sinhalese hatred of the Tamils since the Sinhalese emigrated to Sri Lanka from Persia or perhaps from north India. The Sinhalese civilian leaders along with the Sinhalese general public have been organizing and undertaking the Tamil genocide. The Tamils need a place to be safe. This goal should be aided by the UNHRC. It can be reached by referendum like the one held in South Sudan in 2011. In 2009, over 145,000 Tamils were massacred by the Sinhalese military. No Sinhalese had asked or demonstrated to stop the mass killing of the Tamils in 2009. The Tamils continue to be the victims from sexual assault, abductions, homelessness, and unemployment. The Sinhalization of the Tamil homeland is occurring through forceful settlements of Sinhalese, widespread Mahavamsa Sinhalese symbols, and the intimidation of Tamils by the occupying Sri Lankan army. It is therefore urgently the case that Tamils need their freedom from the Sinhalese people. This can be done only by referendum or by imposing Bionian style federalism. However, most of the people would overwhelmingly prefer separation from the Sinhalese for the sake of Tamil safety. We hope you all respectfully agree with the Tamils and will do the right thing. Please help stop this devolution of power and add “Referendum” in the UNHRC’s 34/1 resolution for promoting reconciliation, accountability and human rights in Sri Lanka. இந்தியாவில் தமிழர்கள் வாக்களிக்கும் முன் சோனியாவின் காங்கிரஸால் நடத்தப்பட்ட தமிழ் இனப்படுகொலையை நினைவில் கொள்ளவேண்டும்.